Sail into a world that few have ever experienced; idyllic islands and isolated villages where unique time-honoured traditions and elaborately costumed dancers welcome us into their world. Sail from Honiara, the capital of the Solomon Islands, to discover the beauty of the outer Solomon Islands. Relax as our ship glides into secluded bays, and takes us to remote oceanic islands where the art of traditional navigation lives today. On Santa Isabel the rhythms of life continue little changed, with daily life centered around the village and family. Malaita is culturally rich, the traditional currency, Malaitan shell-money, is still made on the island and is used as a dowry, and worn as a status symbol. Our journey offers some of the greatest underwater experiences in the world and everybody will have the opportunity to snorkel and appreciate the beauty beneath the waves. Snorkel at Million Dollar Point, where there are a multitude of bulldozers, cranes, fork lifts, and trucks piled upon one another in this unique dive site, justifiably giving this location its worthy name. And then there is the abundance of marine life and coral gardens that draw you into a magical underwater world that truly is waiting to be explored elsewhere on our expedition. For birders this itinerary offers once in a lifetime species on remote islands where few have been before, endemic birdlife such as the Solomon Sea Eagle may be spotted. The birding potential is exceptional and to allow birders to maximise the opportunities on the expedition there will be an optional specialised birding programme with customised excursions. A picture postcard paradise awaits us as we uncover the Secrets of Melanesia. Arrive in the port town of Honiara and transfer to the Solomon Kitano Mendana Hotel for the first night. This evening meet with your fellow travellers and the expedition team over dinner at the resort. Honiara was founded as a military base during World War II and was witness to the Naval Battle of Guadalcanal. Tour Honiara, visiting historical sites including Henderson Airfield. Birdwatchers will head to Mt Austen in search of some of the Solomon Islands’ most spectacular birds including the Solomon Sea Eagle. Board the Spirit of Enderby this afternoon. After familiarising yourself with your cabin and the ship join the captain and expedition team on the bridge. One of the largest and highest islands in the Solomon Islands, most of Isabel remains unexplored and undiscovered. We will head for the remote southern shores and Thousand Ships Harbour which is nestled between San Jorge Island and the high peaks of southern Santa Isabel. The multitude of inlets, channels and bays provide numerous opportunities for our days exploration. Mountainous Malaita is home to one-third of the Solomon’s total population, with pristine rivers and unexploited tropical forests. Anchoring in one of the harbours on the western side of the island, we’ll spend the day ashore, including a visit to Langa Langa Lagoon, famous for its artificial islands. An excursion into the hills behind Auki provides good chances of sighting birds endemic to Malaita. Today we explore the archipelago of Vanikolo, with its five islands encapsulated by a dramatic barrier reef which offers superb snorkelling. French explorer Jean-François de La Pérouse was wrecked here after both his vessels, La Boussole and Astrolabe, struck the reef in 1788. On the shore we visit a monument to Le Perouse, erected by fellow explorer Dumont Durville in 1827. Join the naturalists on a forest walk in search of the endemic White-eye and Monarch or marvel at the delicate Vanikoro Orchid. We also have a good chance to see the recently rediscovered Vanikoro Flying Fox. The Spirit of Enderby will make an inaugural visit to Ambryn, renowned as the island of volcanoes and magic throughout Vanuatu. We plan to head ashore at Ranon on the northern coast where the traditional Rom dance is still practised and custom carving is alive and well. A short walk through the forest brings us to the ‘arena’ where masked dancers emerge from the forest. The forests of Ambryn offer some excellent walks to go in search of the local birds and plants, accompanied by our naturalists. This afternoon enjoy a final snorkel excursion. Arrive into Port Vila early morning and disembark. Upon disembarking a transfer to your central hotel or the airport will conclude your voyage. On this voyage we can offer a unique kayaking experience. There is no better way to fit in with the locals, often paddling in their own dugouts, and to experience the stunning coral reefs. These self-propelled craft allow you to enjoy short excursions up small rivers or creeks into tropical jungle, rainforest or mangroves, sometimes beyond the reach of our Zodiacs. She carries just 50 passengers and was refurbished in November 2004 to provide comfortable accommodation in twin share cabins approximately half of which have private facilities. 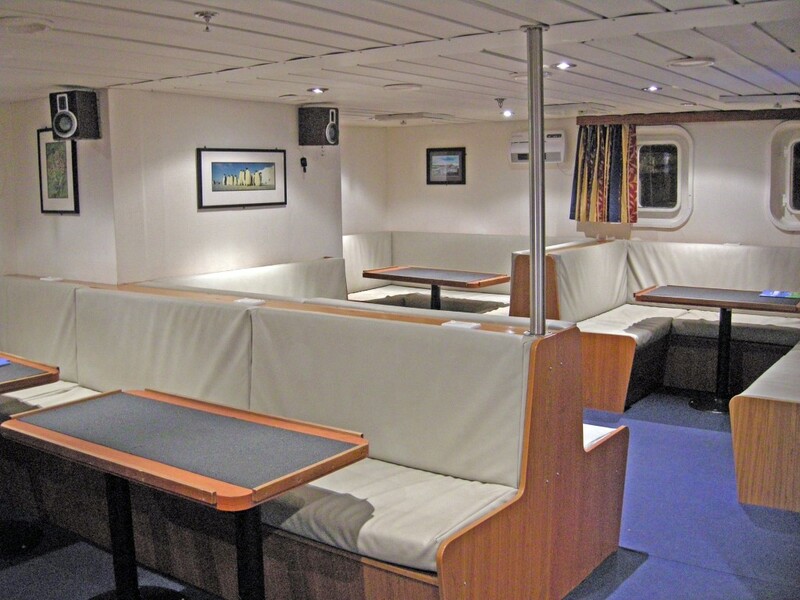 All cabins have outside windows or portholes and ample storage space. a) our fleet of RIB’s, (rigid inflatable boats) sometimes referred to as zodiacs. These extremely safe and stable craft will land you at some of the most amazing places.